I can’t believe that I am writing after a year now. Procrastination has become my second nature . Also it was busy and lot of things happened in last one year. My brother-in-law’s wife, Sarah who is 30 years old got diagnosed with Adrenal cancer (stage IV) last year. Life changed for all of us in one year. Most of the things changed for good. I read so many books on cancer, healthy diet, mind, body and lifestyle. It felt like there is a different world out there. It has been a good learning experience. I would love to share with you all what all I learned in this past one year. A lot of my following blog posts might be on the same topic. Its been amazing to see Sumit and Sarah’s attitude in life. I have heard of many such people in books and movies but have NEVER seen such positive people in my life. It has been no less than a roller coaster ride for both of them. Sarah had five scans after her first surgery (where her tumor was completely removed) . Every time we hoped that tumor would have shrunk but each scan showed a huge growth in her tumor. Despite of all this, I NEVER saw Sumit losing hope. He used to be the one giving hope to others. Till this day, they both are like – FIGHT ON ! The other day I was reading this book on cancer with an article “Being passive vs being peaceful”. It says God wants us to be peaceful with whatever the situation is but never passive. He wants us to do the best we can. Its during these tough times when we remain peaceful that our true potential comes out. When we are peaceful, mind is calm and we can always come up with better solutions. Sumit is a perfect example of this behavior. Every time, scan showed a growth, instead of being worried about it, he would think with a calm mind about the next step. 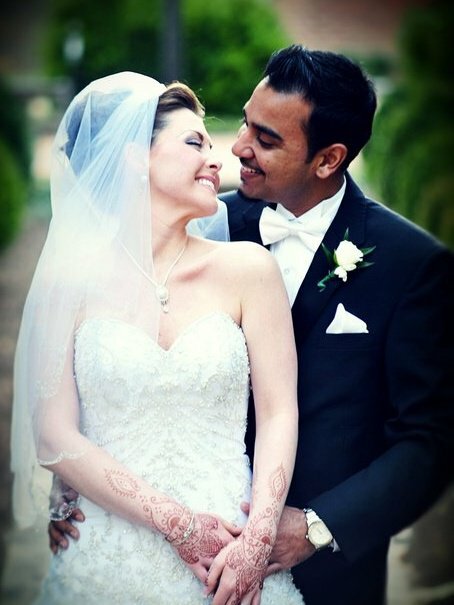 Sumit and Sarah got married on March 5, 2011. If you are wondering how come they got married in this situation then you should know that they have been together for last 11 years and they JUST wanted to get married. Doctors were not sure if Sarah will be able to make it to her wedding day. It was TRULY God’s grace that it was one of the most beautiful wedding I have witnessed. A week after their wedding, Sarah’s tumor started bleeding and they had to do another surgery. When both of them should be enjoying their honeymoon, they were in the hospital telling the doctor what should be done if her lungs or heart stops working or she goes into coma. At this point, all her doctors at UNC and Duke had given up on her and told her “You should go home and enjoy your days” . Sumit and Sarah didn’t give up even at this point and remain as peaceful as anyone could but were never passive about the situation. Instead of wasting their energy in worrying they both used it to come up with a solution. Sumit decided to send an email to as many people as possible in the world to find the right doctor for Sarah. We asked all our friends and family to forward that email to their friends and family. We received some 350 replies in the first two days. It was through those emails that we found about a non-conventional doctor in Houston,Texas. On March 12, 2011, doctors had given Sarah couple of weeks to live. Sarah is not in the perfect health right now but has been doing better with this new treatment. We all are truly hoping that this treatment works. Irrespective of whether this treatment works or not- Always remember that a peaceful mind works better than a worried mind. It applies to everyday’s situations whether its losing a job, losing a loved one, not getting your desired promotion or anything else. I believe that “Everything happens for a reason and that reason might not be in front of us“. If we look at every situation with a peaceful attitude, we get to see the blessings hidden in the form of hardships and pain. Each and everyone in our family learned their own lessons from this whole experience. Each and everyone in our family loves and believes in God more than before. However If you are peaceful but passive then you are not standing for anything and letting the life you were meant for slip away. Life is precious and beautiful. Imagine Sarah is very happy when she is able to walk a block or sleep on your side because of pain so be grateful for EVERY SMALL thing that has been given to you- family to love, friends to share, air to breathe, food to eat, clothes to wear, face to smile . Be Peaceful but Not Passive ! Shweta, this is one of your best posts. So inspiring. I wish Sumit and Sarah lot of luck. God will surely help this couple. Awesome blog. It was so inspiring to read Sumit and Sarah’s story. It was so heart touching. God bless them both. If we all start valuing small things in life, life will become really beautiful. Than you so much for sharing such an inspirational case of your family. Please keep on writing about “life”, “approach & attitude toward life”. Your thoughts , your writing really brings changes in my life. Hi Shweta ! First of all I would thank God that you are back. Lately I too had some incidents in my life, where I had to let go a loved one. It was painful and there was lot of turbulence in my mind and heart. As usual this post of urs has shown me a way how to deal with the event. Hope,I can put some thing into practice. Lastly, please keep up posting in your free time. Believe me your posts can help many people in many ways. Hats off !! n I shall pray for Sumit n Sarah…. God made such a beautiful place where we live and so is the life we spend….. he is so divine that he gives cherishing moments even to those who are not worth living. He will surely bless them. He always has some god plans for all his children. my good wishes to sarah & sumit…it seems life is a long journey while travelling we have lots of stopages and got to meet lots of people ….u are one of the unseen unspoken unmeet person…i can imagine sarah after reading ur views..she seems to be very beautiful and full of life…i have everything good thing in my life .. loving husband,good health,money,home,comforts, luxury even then something is lacking…i dont know what is that…i just wishto god that sarah and sumit will get all good things from my life as they really need it…my emptiness will still remain the same and atleast someone somewhere will be happy..
Nice to hear from you again and sorry to hear about Sarah. Medical doctors call these things as street drugs but no harm trying. I am sure its safe. Wish her All the best.. I lost my dad in January in 2011 , I like what you wrote and relate to it , My Dad was my best friend, Cancer could take away his physical presence from me but it cant kill the ideas he stood for . You can just type ( my name ) Anirban R Banerjee in google and you can read more about him and his ideas.